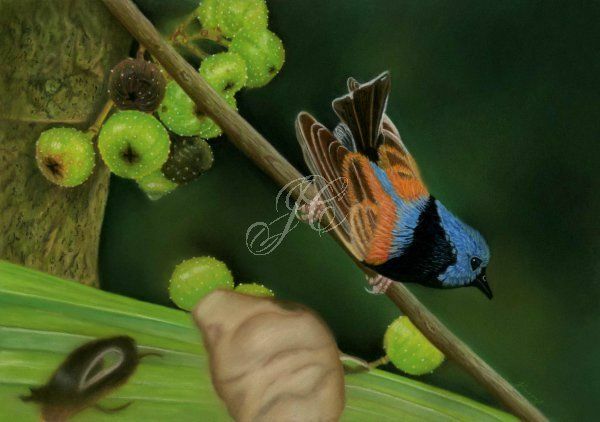 This is the 11th painting in my Fairy Wrens of Australia series. It features a male Lovely Fairy Wren (Malurus Amabilis) perched on a branch. It is commonly found in northeastern Australia in subtropical or tropical areas of dry forest or moist lowland forest areas. It belongs to a group of four very similar species of fairy wrens know collectively as Chestnut-shouldered fairy wrens, the other three species that make up this group are the variegated fairy wren, the red winged fairy wren and the blue breasted fairy wren. Artist Quality Pastel Pencils and soft pastels on Clairefontaine Pastelmat. Reference photo by James Niland. Original Pastel Painting is framed and ready to ship and Archival Giclee Prints are available in a range of sizes.